Are The Auguries Favorable for Norristown, At Long Last? I’ve enjoyed speculating about my international audience (and speculation is the best word I can apply to it) during my first two posts of this year. But now it’s back to the U.S.A., specifically the lower Schuylkill Valley in Pennsylvania. If my primary goal was to maximize my pageviews, I would write every future post about Phoenixville, Pa. But it’s time to return to the real world as shared by many more small towns than that of Phoenixville, including five of its fellow towns along the lower river (I don’t count the Conshohockens). I again address specifically the condition of Norristown, but with something of a twist. I’m actually trending confident on the town’s future. That may be difficult to do at this point, given the snow situation in the Borough, so my timing is not exactly good, but oh well. I know that County and municipal officials have been talking about good times coming for a while now, and I’m late to the party, but I don’t see my role as that of cheerleader. I’m not from Missouri, I’m from Kansas, but that’s close enough. I too got to be showed. That’s happening. A picture—hazy yet evolving—is taking shape. It’s rather like a paint-by-number set with only a few of the colors filled in. That picture is of a Norristown undergoing a revival, at least that’s what I think I see. The primary colors are being painted in, some for the first time, and they are the important ones. Some are being applied, as projects currently underway, but too early in the process to affect much yet. Others are just sitting there, waiting to be applied, in the form of plans or perhaps even dreams. First, let me confess that the method by which I arrived at this less-than-certain conclusion is no more scientific than casting bones or reading the entrails of a sheep, but at least it is based on facts. In fact (sorry about that), it is utterly deficient in any sort of what is usually termed “feeling.” People in a town—or at least some of them—can sense, feel when their town seems to be turning a corner, just as they sensed it declining. It’s partially based on facts, as they see new businesses appearing, or old ones being spiffed-up, and it’s partially wish fulfillment. Even so, the test is whether it is contagious. Do others feel the same thing? If so, then it’s real. I can possess no such feeling. This is the view from outside, although in this day of social media, access to the inside is a great deal better than it used to be. I pay close attention to what is published about the towns on which I focus, particularly when “published” is by amateurs. They will say what they actually think. I discern, amass and sort this collection of items, then attempt to assess them, absent those emotional elements that residence within the town may have implanted in me, in either a positive or negative way. This isn’t a replacement for your feelings, those of you who do live in these towns, not by any means. It is merely additional information, to strengthen your appreciation for what is happening. There is an advantage to viewing from the outside; it can offer a wider perspective. That’s what motivates this post, and those to come on the subject of a Norristown revival. I base my optimism more on what is happening outside the borough, although not entirely. There are several components to this emerging picture, which I will take up in future posts. Not all of them are positive, but I will leave those to the last. Those “primary colors” referred to above are the three fundamental realities of life along the river. A town’s relationship to them has determined the status of each; always has and always will. The problem is that the realities change. Today, each trend positive for the Norristown area. This is the first time that all three have pointed in that direction in far too many years. That is what I shall focus on, and explain what I mean. Keep in mind, however, that the favorable state of the three fundamental realities is not, by itself, sufficient to bring about a revival. The residents and their leaders must take advantage of them. Notice I said “the Norristown area.” That’s because no revival of Norristown is possible without an accompanying revival of Bridgeport. The two towns lie largely in full view of one another, and the people and businesses everyone wants to attract to either will have to like that view if they are going to show up and put down roots. Norristown and Bridgeport rose together then declined together, and must again rise together if either is to rise at all. Norristown will get most of the attention in the posts that follow, but Bridgeport will not be ignored. The fundamental realities are all trending positive, so the key to the future will be the reception Norristown’s people give to these realities in their current form. While I consider all three changing realities as positive, that’s a net conclusion. Nothing is ever solely positive for everyone. Only one reality approaches that standard, and I will discuss it. Another has some negativity built into it, but that must be accepted, together with steps to minimize that result. The third reality is the tough one. I believe that its recent changes are quite positive, and I can point to history to support my conclusion. Nonetheless, an unpleasant fact of our current times is that a portion—perhaps a substantial one—of Norristown’s people do not see the changes in this third reality as positive at all. Too many would already classify the current situation as a negative, and if what I consider to be a positive trend continues, the portion of the borough’s population that comes to consider this a negative may well increase. If this portion proves to be substantial, then Norristown’s path to revival will be longer, more tumultuous, and it will not take the borough nearly as far as it should and could. I’ll close this blog series with a discussion of this issue, but I want to begin—and continue for as long as possible on a positive note. 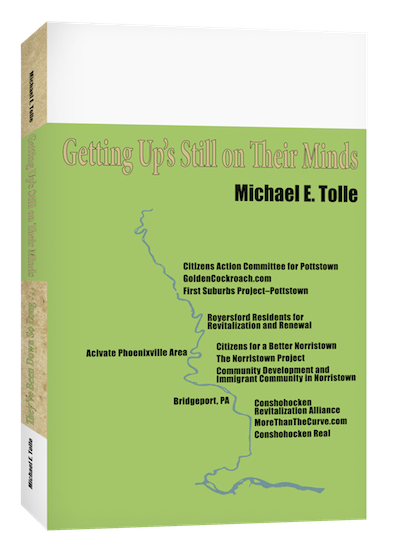 Next time I will address the evolving situation just outside the Norristown area, which is the prime driver of both specific projects and a better feeling about the future. If this situation continues to evolve along recent lines, the Norristown area will become more and more attractive to better-off people and businesses. A potentially great opportunity looms; can Norristown and Bridgeport take advantage of it? Phoenixville, Pennsylvania And Ukraine? It’s A Puzzlement! I am dedicating the first two posts of 2016 to my international audience, and the questions that arise from their patronage. The first post dealt with the steady, but mysterious, number of pageviews my posts receive from Norway. In only one year, Norway has move to a solid number two in the rankings by country. The lousy metrics on my blog site don’t allow me to process the numbers exactly, and it appears that while the largest number view my most recent post first, a substantial number of pageviews are spread through my previous posts, steadily raising their totals. As always, I asked the question “why?” At this point, I’m still hoping for some insight. I was sorely tempted to write about Phoenixville for my first post of 2016, considering that it marked exactly one year since I began my “Why Phoenixville?” series. I didn’t, but here is my second post, and I’m back to Phoenixville. Specifically, I want to inquire into another foreign connection, this time between Phoenixville and Ukraine, a country a long way away. The facts surrounding this more specific connection are far more complex and puzzling, but here’s what I know so far. The Phoenixville/Ukraine connection appears on only two of my seven posts about Phoenixville, both guest posts, but it has made itself felt in a big way. I published the first guest post on August 7. It exploded, almost entirely from overseas. It garnered a huge number of pageviews from Russia, then seemed to spread almost geographically, to Ukraine, and then the Middle East. It even received an appreciable number of pageviews from Iraq, of all places. It is my number one post for pageviews, by a considerable margin. My second guest post on Phoenixville was published on November 27. It pageview stats reveal that it bypassed Russia entirely but began immediately to post large numbers from Ukraine. Those numbers have continued to build, but there was no geographic spread as with the first guest post; just Ukraine. It very quickly rose to become the second most-viewed post of all. What was curious is why an overwhelming number of those pageviews came from Ukraine, but not Russia or any of the other countries that viewed the first post. What little I know suggests that there is a connection between what happened to these two posts, and that Ukraine’s Internet interest in Phoenixville stemmed from the first guest post, to appear fully in the second. That’s why I posted a question on several Phoenixville Facebook pages: why should my blog’s second guest post have received so many pageviews from Ukraine? Several people replied, most mentioning the Sts. Peter and Paul Ukrainian Catholic Church in the Borough. I have decided to follow that lead. The Ukranian Church connection between my occasional posts and Internet users in Ukraine is quite plausible, and will serve as a working thesis for further research. So far, so good, but while you can outline “why” in a thesis, you have to demonstrate the “how” to prove your thesis. I’m still in the dark about that. The connection is logical, but cannot be demonstrated. Logic is sufficient proof for many, but not for me. That’s why I call this a thesis, not a conclusion, or even an opinion. 2. Both guest posts are not just ranked number one and two overall for pageviews, but have received hugely more of them than the other posts about Phoenixville. I have published a total of seven posts entitled “Why Phoenixville?” since January, 2015. The first and second guest posts are numbers one and two respectively, on my all-time list of pageviews. The gap between them however, is substantial. That’s because Russia has largely ignored the second one while Ukraine loved it, causing it to displace Russia from third place on my all-time pageviews-by-country list (Norway is second, by the way). The gap between them and the other Phoenixville posts is, however, even larger. My two Phoenixville guest posts stand head, shoulders and torso above all other posts in pageviews. The greater numbers for those two stem almost entirely from overseas views. The two guest posts clearly tell a different story; I just don’t know what that story might be. 3. Where is the religious connection? Religion barely figures in any of the seven posts. There is a brief reference to religious diversity in my September 17th post, but no mention of any Ukrainian church, in that post or any other, including the two guest posts. In fact, there is no mention of any church by name, anywhere. So where is the religious connection, the trigger that generates interest? On a final note, what will happen with this post? It’s the only one that mentions Ukraine in the title. How will it play there, or Russia, not to mention Iraq? To date, my most promising thought is that someone (or something) functions as a “gatekeeper.” The connection simply can’t be direct between two posts on an obscure blog about America and thousands of Internet users in Russia and Ukraine. And so I ask you, my readers, regardless of your nation of residence, to enlighten me about what is happening. Is there actually a connection between Phoenixville, Pennsylvania and Ukraine? If so, what could it be? It’s a puzzlement. Any thoughts? This Is For My Loyal Readers In Norway: Thank You! I hope that everyone who reads these words will have a happy, successful and above all healthy 2016, as will your loved ones. I am definitely looking forward to the new year. That’s largely because I expect 2016 will provide me with an ample number of subjects to discuss, as did 2015. Several of these will be carryovers, subjects that just keep on occurring. But first I want to acknowledge two significant holdover issues from last year, one in this post and one in the next. Both are structured as questions, because I would like to know more from my readers. Only they—you—know the answers. 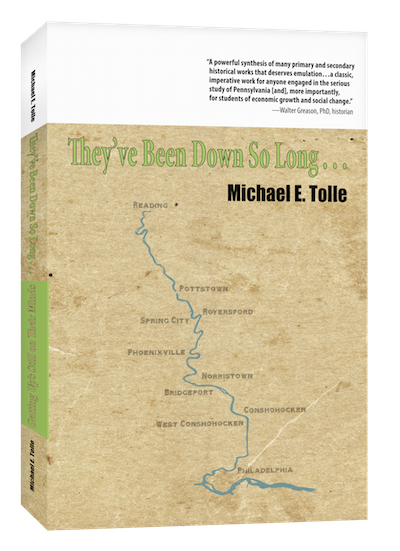 Everyone who reads this blog knows that while I deal with major issues facing our country today, my specific examples to illustrate those issues derive almost exclusively from eight small towns on the lower Schuylkill River in Pennsylvania. That’s a pretty tight focus, but the Internet knows no geographic boundaries, so my posts are accessible to anyone, anywhere, at least as far as I know. In my next post I will the discuss the interest Ukraine seems to have about Phoenixville, but first I want to acknowledge and say “Thank You” to a loyal group of followers from Norway. Yes, Norway. Beginning in December of last year, I have received some 200-300 pageviews from Norway every week, without fail. So, I employ this post to address my Norwegian readers directly, and ask the question I always ask: Why? I believe I know how I was introduced to your country, perhaps. In November of 2014, I attended a reunion of my wife’s family, which is predominately Norwegian. Two family members came all the way from Norway! I was impressed that they had traveled such a distance to meet with people they did not know, and gave them a signed copy of my book, What Killed Downtown? 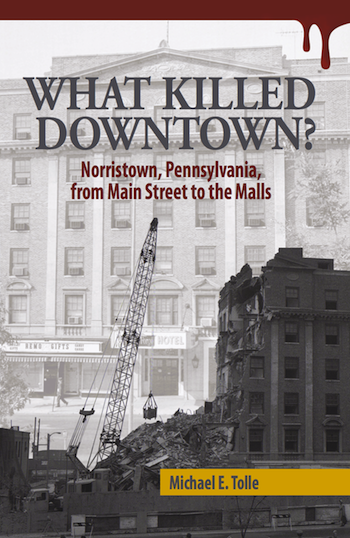 Norristown, Pennsylvania, From Main Street to the Malls. This was in November, and my Norwegian pageviews exploded in December. It doesn’t take Sherlock Holmes to see a connection. Am I right about this? Initial—or periodic—interest is one thing, but sustained interest over an entire year is something else entirely. Unlike my popularity in Ukraine (the subject of my next post), which is very post-specific, my pageviews from Norway arrive every week, regardless of subject. Although the metrics on my blog site do not allow me to analyze the response from specific countries to specific posts (in truth, they don’t allow me to analyze much of anything), I am continually pleased that attention is not paid solely to the current post. Most of my earlier posts (pre-2015) have been steadily been accumulating pageviews. As pleased as I am by appearances, I am going to assume nothing. After all, I recently read (on the Internet, of course, so keep that in mind) that Norwegians employ the word “Texas” as a synonym for “crazy.” I’d like to think I haven’t earned any such status, but this post is phrased as a question, because I simply know almost nothing about why—and how—my posts seem to attract continued attention in Norway. That’s why I am asking you, my readers in Norway, to email me at mike@michaeltolle.com, or leave a comment on my blog site. I very much want to know more about you. I don’t speak a word of Norwegian, but will have them translated, so feel free.